Unit measures 5" tall x 16" wide x 10.5" deep. 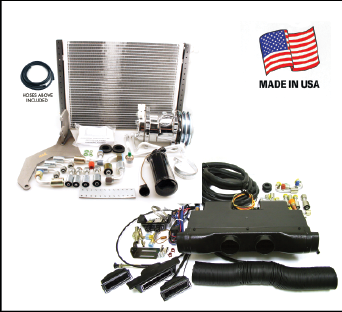 Features temp & fan controls, all dash vents & hoses, street rod condenser, new compressor,compressor engine mounting bracket, unit mounting brackets, drain hoses, barrier hose kit, all fittings & drier. Complete kit from A-to-Z. DOES NOT INCLUDE HEATER HOSE.